Two of the most beloved dolls are together to make an extra special birthday party! 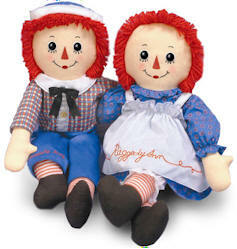 Great for siblings, twins or anyone who loves Raggedy Ann and Andy. Red checked gingham invitations. If you can't find gingham invitations glue gingham material or paper onto blank white cards. Fill in party information in blue ink. Check Ebay for handmade Raggedy Ann and Andy party invitations. There are many different versions to choose from at great prices. Theme colors: Red, blue and white. Decorate the Raggedy Ann and Andy birthday party in red, blue and white. Cover tables with red and white gingham tablecloths. Place helium balloons at each chair and/or place a bunch of balloons on the table. Use blue and red streamers. A fun idea is to cut strips of red streamers in varying lengths from 7" - 10". Then tape them side by side along the length of a mantle, doorway or stairway. This is fun and looks like Raggedy Ann and Andy's mop hair. Make heart shaped cookies and let the party guests decorate them with icing, sprinkles and red candies. Cut circles from poster board about 7" in diameter. Gather items to decorate the faces such as ... red yarn, buttons, triangles, black yarn, etc. to make Raggedy Ann and Andy faces. Buy or make a large poster of Raggedy Ann and Andy. Cut out hearts from poster board - one for each party guest. Decorate them like the heart on the Raggedy Ann and Andy dolls or make them solid red. Put tape behind the hearts and write the guests name on the heart. Line party guests up and one at a time blindfold them and have them try and pin the heart the closest to the real heart of Raggedy Ann and Andy. The winner gets a prize. Divide guests into 2 groups. Have each group line up one behind the other. Give teams each a spoon and several candy hearts. About 20 - 30 feet (farther if you have the room) set up 2 orange cones. One at a time guests have to carry the candy hearts on the spoon to the orange cones and back. Continue until everyone on the team has had a turn. The team with everyone back first wins. If they drop the hearts they must stop and return to the front of the line and try again. Red and white gingham bandanas - wrap party favors up and tie the four corners together. Red paper bags - fill with party favors and then fold over. On the part that is folded over cut fringe with scissors to look like mop hair.